For situations in which you can’t deliver a fly to a fish via the usual cast-and-drift methods, expedience is more important than elegance. If an ugly cast or a clumsy technique can get the job done, then don’t hesitate to try it. IN THE BEST of all possible worlds, the conditions would be perfect each time we waded into a stream: We’d find a classic pool-riffle-pool stretch of water with plenty of room for a backcast and big trout rising to a hatch within easy casting range. Such is the stuff of which fly-fishing dreams are made. But for most of us, reality is often much more troublesome and complicated. What makes the sport so paradoxically frustrating and fascinating is that it presents the angler with a seemingly endless string of problems that need to be solved before he can get on with the business of wrestling a fish into the net. Sometimes it’s an overhanging branch that seems to reach out and snag your fly on the last false cast. Or perhaps it’s a gale-force wind that seems to be in your face no matter which way you turn. Or maybe it’s a set of conflicting currents so complex that a dead drift is nigh impossible. The list goes on and on. When I was a guide in the mid-1990s, I had the opportunity to watch my clients attempt to overcome such difficulties on a daily basis. Of course, it was my job to offer advice, but I think I learned as much from them as they from me. One of the great lessons I took away from the experience is that classic “proper” fly-fishing technique is not always the solution to a presentation conundrum. In certain situations, a deliberately sloppy cast or ugly drift is the only way you’re going to get the fly to the fish. Here are a few examples. Trout can be very inconsiderate, choosing to hold in very inconvenient spots–under overhanging limbs, in tight slots, or amidst myriad currents of different speeds–that make a traditional upstream presentation impossible. In some cases, the only way to get a fly into the trout’s feeding lane is to approach from upstream and to use your rod tip to guide the fly to the fish. This crude technique, called the drop-and-drag , requires none of the classic fly-fishing skills you’ve worked so hard to perfect, such as delicate casting and timely mending. Instead, it’s more like cane-pole fishing with a fly. Whereas you normally do everything possible to keep the fly from dragging on the surface, with this technique you use the drag to your advantage. This photo illustrates how the drop-and-drag technique works in a real-life angling situation. The eddy behind the midstream boulder and the downed tree make it impossible to dead-drift a fly through the slot between the rocks from downstream. The angler began by casting to the side (A), and then he dragged his fly into position (B). 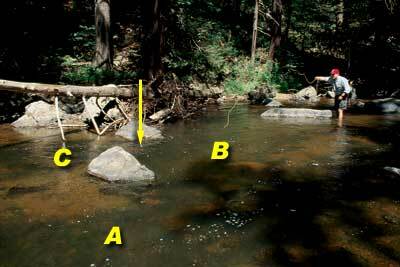 Because the rocks split the current, he is using his rod to steer the fly through the slot (C). The arrow points to the fly on its way to the target. If you spot a fish in a lie that is unreachable with a regular cast, set up in a position upstream. Slather your dry fly with plenty of floatant, and then cast slightly beyond and a couple of yards to one side of the target. As soon as the fly hits the water, lift your rod tip to get as much line off the water as possible, and then drag the fly across the surface into position for a good drift. In some cases, this means simply putting the fly into the right part of the current, which will deliver the fly to the fish. If space is tighter and there are more complex currents or obstacles, however, you have to actually steer the fly to the fish using your rod tip. Either way, when the fly is lined up, start lowering your rod tip to feed slack into the drift and to direct the fly toward the fish. It’s okay if the fly continues dragging a bit as you position the fly just right. 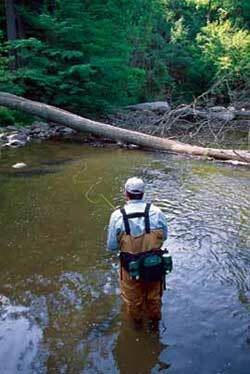 As long as the dead drift begins a few feet above the trout lie, your fiddling shouldn’t spook the fish. If you don’t draw a strike, continue to lower the rod tip until the fly floats through the trout’s feeding zone. Allow the fly to continue downstream until the line straightens at the end of the drift, and then sweep your rod to the side to move both the fly and the line out of the trout’s sight window. Then you can pick up without spooking the fish. I’ve seen this technique used to great effect for presenting flies to trout that are holding between two rocks or hiding under overhanging bushes or trees — as well as to those that are refusing any fly outside a two-inch-wide feeding lane. Anglers who are skilled at the drop-and-drag can deliver a fly with pinpoint accuracy, practically guiding the fly right into a trout’s mouth. One of my favorite fishing holes in Yellowstone National Park is just below the attraction called Mud Volcano, where the Yellowstone River flows over a ledge of volcanic rock into a very deep pool. When insects are hatching, huge cutthroats come to the surface to feed at the center of the pool, but because the pool is so large and so deep at the edges, there’s no way to cast to these fish from the bank or from downstream. The only way to present a dry fly is to stand at the edge of the ledge, make a 40-foot cast directly downstream, and then allow the fly to dead drift. Most fly fishermen can cast 40 feet, so that’s not a problem. 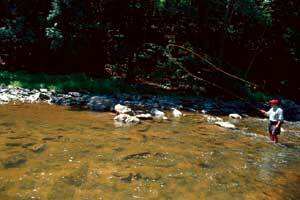 Achieving a good dead-drift at the end of a downstream cast is another story. Anglers have been taught that the line should straighten completely at the end of a cast, but when you’re casting downstream, this “proper” casting technique causes the fly to begin dragging immediately, making a dead drift impossible. My most skilled clients, those who were able to hook the fish in this pool, figured out that the key to this presentation wasslack. To make a good downstream dry-fly presentation, you must throw some slack into your cast and allow the fly to take up this slack as it drifts away from you. Most of the time, this does not allow for a very long drift. For instance, if you can deliver the fly 40 feet, but use 50 feet of line to do so, then you should get a 10-foot dead drift before the fly drags. 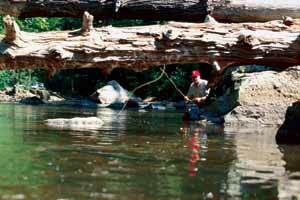 Once you’ve located a rising fish, drop your slack cast just upstream of the trout’s locations, and allow the fly to drift through the feeding lane. There are two basic ways to accomplish a downstream slack-line cast, each of which requires the caster to do something that he has been taught is wrong. The S Cast. Perhaps the most common technique for adding slack to a downstream presentation, the S cast easy to accomplish. After you have stopped the rod on the forward cast, wave the rod tip back and forth three or four times before the line touches down on the water. Make sure that you stop the rod first , and wave the rod tip just about 6 inches in each direction. The waving of the rod tip creates s-curves of slack in your line, which will straighten as the fly moves downstream. The main problem with the S cast is that it places most of the slack close to the angler, rather than close to the fly. If you are casting into a fairly uniform current, this is not usually a problem. However, if there are competing currents or if the fly lands in water that is moving faster than the slack line, the fly will quickly start to drag. Thus, the S cast works best for fairly short casts. The Pile Cast. Another way to perform a slack line cast is to make a purposely underpowered forward cast — called a pile cast or puddle cast — which places all of the slack at the leader end of the fly line. Done correctly, the pile cast is a thing of beauty, as the leader and the first few feet of fly line fall gently to the water in a controlled jumble. The big advantage of the pile cast is that, with all of the slack at the business end of the fly line, the fly itself is free to drift unencumbered and is less likely to be affected by complex currents pushing on the belly of the fly line. ... and the pile cast, in which you direct the forward cast upward and then drop your rod tip, causing the end of the line to flutter to the surface. The key to making a pile cast is directing the fly line upward, rather than outward, on the presentation cast. Begin with a low backcast, and then stop the rod high on the forward cast, throwing the line toward the sky at about a 45-degree angle from horizontal. As the line straightens out, drop your rod tip to the water’s surface, and watch the line and leader flutter to the water. Only through practice can you learn the right amount of power required to put the slack where you want it. An accomplished caster ends up with a straight length of fly line from his rod tip to a small pile of slack, out of which extend the tippet and fly. No matter which of these methods you use to make a downstream presentation, be sure that your fly lands several yards upstream of where you think a fish might be. (If you’ve seen the fish rising, you’ll know exactly where it is.) This way, the fly can drift away from the rest of the line, and by the time the fish sees it, the fly is floating all by itself. When the fish strikes, raise the rod tip and quickly strip in line to pick up all the slack. I discovered another great use for the pile cast a few years ago on the Colorado River near Kremmling , Colorado . A few of us were taking a lunch break at a riverside picnic table, when we notice a large cutthroat in an eddy, sipping small mayflies from the thick layer of foam on the surface. It was a tight spot: on one side of the eddy was the river’s main current, and on the other was the mouth of a small creek. The only way to approach the eddy would be from the slack water directly downstream. As the fish continued to rise every 30 seconds or so, we munched our sandwiches and debated how best to present a fly. The water in the eddy was rotating pretty quickly, so it would be tough to keep a fly in one place for very long. Finally, Bill couldn’t take it any longer, so he put down his food, picked up his rod, and waded in below the eddy. Of course, the rest of us began heckling and shouting contradictory advice. Bill’s first couple of casts confirmed what we had surmised: No matter the angle of attack, the proximity of the main current, slack water, and the swirling eddy meant that Bill’s fly began dragging almost as soon at it hit the water. The cutthroat continued to rise to bugs in the foam, but it wouldn’t touch Bill’s skating fly. If he were going to tempt this trout, he’d need a special cast. Because the foam on the surface of the eddy was quite thick, Bill wasn’t much concerned about spooking the fish, so he waded a little closer and threw his line nearly straight up in the air. We spectators watched with interest as the end of the line and the leader piled in the center of the eddy. The swirling currents immediately went to work on the line, but because there was so much slack, the fly itself remained perfectly still for about 10 seconds…long enough for the fish to find it and eat it. Bill threw his rod tip to the sky, and began stripping furiously and walking backward to pick up the slack. We all rushed down to the river’s edge, nets in hand, to help land the fish, a gorgeous 17-incher. As he cradled the trout, Bill gave us all a look of triumph. No matter who caught the most or the biggest fish that day, he will always be remembered as the guy who came through with a killer presentation in the clutch.